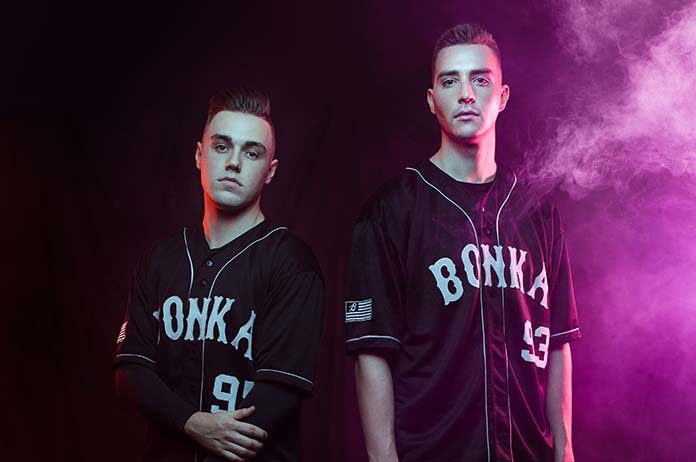 Aussie DJ Duo Bonka recently stopped by Rave It Up HQ to chat about their new single Be Alive featuring Luciana and their upcoming tour. Hey Lachlan & Connor. Welcome to Rave It Up. It’s a pleasure. Thanks for taking out some time to chat with us. Since this is your first time on Rave It Up, we’d love to get to know you guys a little bit better and start from the beginning to get a good idea on how you guys have made it to where you are today. We actually came up with the idea to do a duo back in 2014. We were playing at a house party and started having a jam together. It got a bit wild and the idea was thrown around – ‘Why don’t we start a duo?” From there we played at another house party together and had a great time doing it so from that point, we never played apart and BONKA was born. What brought the idea to life? Was DJing and producing what you always wanted to do with your lives? DJing to us was a hobby and a little side hustle during high school that turned into a full time job. Producing was just the next level in terms of progression as DJs and has helped us progress to firstly interstate and now becoming internationally touring DJs. Well the story goes, Connor was listening to Bonkers by Dizzie Rascal and was at the time looking for a DJ name and he sort of put two and two together and it turned out great to be honest! Your debut original Can’t Stop featuring American top liner Whiskey Pete headed straight into the iTunes Top 10 and #9 on the ARIA club chart. How does that feel? Was that what you were hoping for? It was everything we hoped for and so much more to be honest! It was actually so humbling to not only put our first single out but to see it in the top ten charts, it was truly a surreal experience. You could call this your ‘big break’ in a way but how long were you guys working to hone your craft before this happened? We had been working pretty tirelessly for about two years before we released it in 2016. And obviously just DJing a lot and learning a lot about our music style and where we wanted our production to head prior to that. You’re now being called the ‘The Kings of Mash-Ups’. How did that name come about? Did you start it or did your fans? Well actually the mash-up thing started way back when we were uploading mashups we threw together onto SoundCloud and were giving them out as free downloads to our friends! But as they became more popular we started releasing packs of them and for the past 4 years, we have been putting a pack out every few months. Due to their popularity, fans and other DJs alike have sort of given us the title, which we are extremely humbled to have but we just love playing as many different styles and as many songs as we can in a set. Your new single is titled Be Alive and it’s amazing. Congrats! It features English singer Luciana, who we love. We still play her song I Like That on our radio show. How was it working with her? Luciana has had so many hits over the years and she has always been one of the vocalists which we had dreamt of working with. In terms of working with her, she is one of the best in the business. She is so talented in not only her songwriting, but her delivery as well! So it truly was an honour and privilege to do this track with her and something we still pinch ourselves about. Did you actually get to meet her or did you guys work over the Internet like many other artist collaborations? We met her on her last Australian tour when she played at a club that we were also playing at that night. The collaboration wasn’t organised until a little later via email due to the fact she was in the UK at the time, while we were in Australia. Who wrote the lyrics to this song? We love how much it is a great ‘feel good’ song with the lyrics “It’s good to be alive”. We came up with the music bed and thought she would be amazing for the topline so we sent it across to her. Luciana wrote the topline start to finish, which made the whole process very easy with the vocal being completed in a little under 2 weeks. Can we expect a music video for Be Alive in the future at all? We have a lyric video coming for the record which has turned out great, but in terms of an actual video clip, we are waiting to see the response to the record before making a judgment call on that. You guys have also announced tour dates for your national Be Alive tour. For those coming along to one of the shows on your tour, what can they expect? Basically we love playing to a crowd that can interact with us and feel connected on a personal level. As for the shows, we try to create a fully immersive clubbing experience from start to finish. Our sets are always jam packed with as many vocals, drops in as many different styles as we can fit in to our set! Will you have any supporting acts that you can share with us? Well we are always supported by some of the countries best resident DJs at the various clubs we play at! But where possible we love having legends such as Benibee, Tenzin, Spitfire and Method on board at our shows whenever we can steal them away from their respective busy touring schedules. You will visit cities like Sydney, Cairns, Brisbane, Newcastle, the Gold Coast and many more, but where are you most excited to visit? Honestly we love playing in every city, but we are looking forward to our show at our home club in Brisbane, Eaton’s Hill who host our Brisbane Project BONKA shows. And you guys also have European Dates to be announced real soon. Has your fan base over there grown dramatically? The fan response to us announcing we are coming over for our debut tour has actually been quite remarkable and truly humbling, and we literally can’t wait to head over to show Europe what we do! You guys also produce a monthly show called Let’s Go Bonkas, which is now the #1 iTunes Dance Podcast in Australia. We’d love to know, how do you have time for all of this in your lives? You must be impeccable at time management. The time management side of things is challenging at times that is for sure amongst a busy touring schedule, but it’s something we love putting together as it gives our fans an insight into what tunes we have really been loving in our sets as well as having guest mixes from DJs across Australia and the globe who we are lucky enough to call our mates. During your time in the industry, have you ever had any issues with haters? If so, what do you do about them? Do you just ignore them? I think anyone who is progressing in any field or endeavour has had haters at one point or another, but the only thing you can really do is just keep doing whatever is moving you forward. Obviously it can be upsetting when you either hear or see people not enjoying something you put your heart and soul into and it’s a real shame that people can’t recognise when people are giving their all. However, nobody is loved by absolutely everyone. As long as you do the best you can and be the best person you can be, you can rest easy. Even though you have already achieved so much guys, what else can we expect from you in the future? Ah the future! Pretty exciting times in the BONKA camp to be honest. We have lots of music on the way! Lots of exciting things going on in the background in terms of shows and growing our brand with a few milestones being ticked off to see the year out. What advice would you give to our readers if they would like to follow their dreams of becoming a DJ/Producer? The only advice we can ever give anyone is literally: “You get out what you put in”. If you’re willing to put in the work, sacrifice friendships, blood sweat and tears, the late nights, the tough sets, the ups and downs of this tumultuous industry, then anything is really possible, and I know it sounds super cliché but there are no shortcuts in this gig. What you have is what you have earned. Now we do have a question that all of your female fans would like to know the answer to….Are you guys single? As a closing statement and what is probably the most important question: Knowing what you know now, what would you tell your 14-year-old self? We would probably tell them that at that time in their lives, literally no one has any idea what they are doing and no one can do you better than you. So stop worrying about what others have, what they do or how they look. Because at the end of the day being the best you that you can be is the best achievement any of us can make in this life. And before we go, if the listeners would like to contact you or find out what you are up to, where should they go? Head to our Instagram or Facebook, if you want to chat or ask us a question. Shoot us a message as we are always happy to talk to anyone who wants to talk to us. Thanks again for having a chat to us today Lachlan & Connor. Keep in touch. We’d love to have you back on the show in the future. Thanks for reaching out guys. We would love to come back!